When I was a boy, my dad found a reel push mower at a garage sale for a couple bucks. "Eureka!" he said to me. "Now we'll save a bunch of money cutting the grass." Please reread the first sentence. My dad didn’t replace the toy lawn mower I was using to cut our yard with a “real” lawn mower. My dad replaced the gas-powered lawn mower I used with a “reel” mower, which manually spins a set of blades to cut the grass as you push it across the yard. Sure, it didn’t require any gas (which, in 1970, averaged 36-cents per gallon). 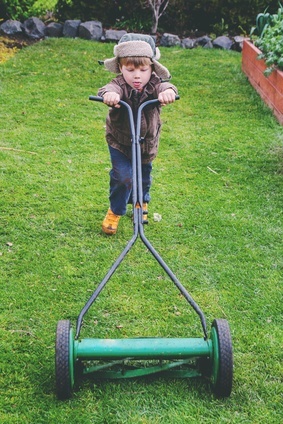 Instead it relied on the power of a weak and whiny nine-year-old to push the mower, which spun the blades, which cut the grass. The experiment lasted two weeks. It took twice as long as before to mow the lawn with the reel mower (which my dad didn’t care too much about). The lawn didn’t look as good since the cut was inconsistent (which he did care about), especially along the fence and around the garden. And the complaints from the grounds crew (me) were louder and more frequent. Sometimes you just have to use the right tools! Several decades later, I talk with dozens of people every month who are using the equivalent of a reel push mower to create their export documents. These people use Word or Excel templates to manually create their export forms. While using computer templates doesn’t require much physical exertion, it does mean that these companies take more time to create their export forms. If you’ve ever felt the pressure of trying to create a set of export documents when you’ve got a shipment ready to go and a truck waiting on the dock, you know you can sweat just as much as when you mow the lawn. And because templates require that you enter the same information over and over again on all the various export forms, all that data entry increases the chances of making a mistake on your paperwork, which can slow down your shipment or, worse yet, slow down getting paid for your shipment. For more than 20 years, thousands of successful export companies have been using Shipping Solutions export documentation software to quickly and accurately create their export forms. And now Shipping Solutions has introduced the latest version of the software, Shipping Solutions Professional version 9.12 and Shipping Solutions Classic version 8.12. Shipping Solutions allows you to create your export forms 5-times faster than more manual methods while also improving the accuracy of your paperwork. It makes it easy to file your Electronic Export Information (EEI) through AESDirect on the ACE portal without any redundant data entry. And the Shipping Solutions Professional version gives you an easy and affordable way to stay compliant with U.S. export regulations. Don’t just take my word for it. Download a free trial version of the Shipping Solutions export software and see how much time you can start saving tomorrow.